Seems like there would be more tree movement possible if all three attachments allowed movement? Thanks for your comments. The main purpose of using flexible joints is not particularly to allow the trees to move, but rather to prevent excessive forces being built up if two trees pull apart or push together. When one tree is used as a fixed point the treehouse can't move around relative to this tree, which has a couple of benefits. The treehouse will re-position in almost the same position (at the flexible joints) when there is no wind, so you don't need to use any form of guide to restrain the structure. 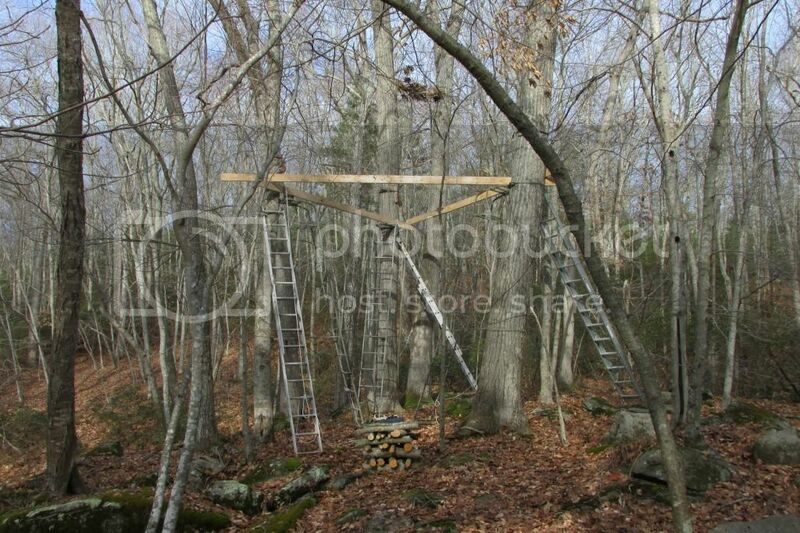 The other reason is that with a solid attachment to one tree the treehouse will be more stable in use. Depending on the type of joint, a fully flexible platform will constantly shift around under the occupant. This doesn't mean it shouldn't ever be used, you just need to be aware of the potential issues. To make the best use of flexible supports, a compromise between stability and flexibility needs to be made. Where beams slide on top of other beams there is quite a lot of friction, requiring more force to overcome the resistance and make the beam slide. This might not seem ideal but as long as the beam slips under load the joint is doing its job. The friction helps to make the treehouse feel more stable in normal use. The most freely moving flexible support is a cable, where there is almost no resistance to movement. This allows the treehouse to move easily, without putting pressure on the other trees, but it also means the treehouse will wobble in use. Both these methods, and others, can be mixed in a single treehouse.